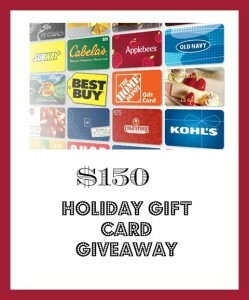 $150 Holiday Gift Card Giveaway! UPDATE: This giveaway has ended. Winner is Melinda D. Thanks for entering! If you could use some extra after holiday cash or a nice gift for yourself, be sure to enter to win this $150 Holiday Gift Card Giveaway! I have teamed up with several of of my fellow bloggers to offer this prize to one lucky winner. You can enter this giveaway through 12/26/13 at 12:01 AM and the winner will be able to select the gift card of his/her choice. It’s easy to enter! You can do so via Rafflecopter below. Disclaimer: I am not responsible for the fulfillment of this prize. This giveaway is sponsored by all of the bloggers participating. View my disclosure policy here. pay my first insurance premium!! I would probably buy textbooks for law school! I would do some after-Christmas deal shopping :) Thanks! oooh! $150 would be so nice! Forgot to add what I would use it for: batteries and other stuff that all the new toys will need, lol! This would a great way to refresh!! Thanks for a great website! Wow! I would love to win this! I could get in on all the after Christmas sales! I would buy a new DVD player. Ours is like 10 years old! Purchase something for myself first and then spend the rest on the family. I’d buy a glider for my nursery. could really use this! scheduled to have csection tomorrow and still need soo much! I will probably spend it on clothing for my grandsons! I’d purchase a BP monitor. After spending on everyone else I just might actually buy something for myself . I would use it towards paying off debt. I would use it towards school clothes for next year. My son will be going to a new school and they don’t require uniforms (YAY!!!) so I am very excited about buying cute clothes instead of ugly uniforms. Buy clothing or something for my kitchen, pick me, pick me. I’d buy a vacuum cleaner! I would use it for groceries for our family holiday gathering in Alabama. I would probably go to target! baby items that are gender specific! Due early Jan and we don’t know if its a boy or a girl! Would love to win this – my son needs a new convertible car seat and this would cover the one I have picked out! I need a new microwave, mine is 7. Moving, so I could use a little bit of everything! I’d prob. use it for something boring like everyday living expenses like food, beauty products and clothes. I would get a new tablet. Thanks! If I win I would give my dad the gift card, since he is so hard to buy for. If I won, I would use the money for the application fee to study abroad in Paris. I would use it to buy something that I would have bought anyways.